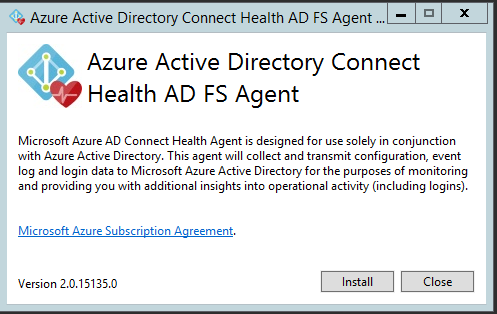 This document walks you through installing and configuring the Azure AD Connect Health Agents. You can download the agents from here. The following table is a list of requirements for using Azure AD Connect Health. Azure AD Premium Azure AD Connect Health is an Azure AD Premium feature and requires Azure AD Premium. To start a free 30-day trial, see Start a trial. You must be a global administrator of your Azure AD to get started with Azure AD Connect Health By default, only the global administrators can install and configure the health agents to get started, access the portal, and perform any operations within Azure AD Connect Health. For more information, see Administering your Azure AD directory. Using Role Based Access Control you can allow access to Azure AD Connect Health to other users in your organization. For more information, see Role Based Access Control for Azure AD Connect Health. 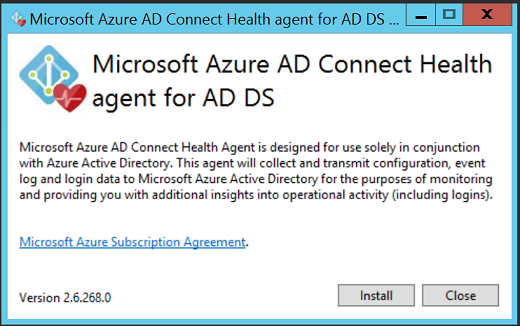 Azure AD Connect Health Agent is installed on each targeted server Azure AD Connect Health requires the Health Agents to be installed and configured on targeted servers to receive the data and provide the Monitoring and Analytics capabilities. For example, to get data from your AD FS infrastructure, the agent must be installed on the AD FS and Web Application Proxy servers. Similarly, to get data on your on-premises AD DS infrastructure, the agent must be installed on the domain controllers. Outbound connectivity based on IP Addresses For IP address based filtering on firewalls, refer to the Azure IP Ranges. Firewall ports on the server running the agent The agent requires the following firewall ports to be open in order for the agent to communicate with the Azure AD Health service endpoints. Allow the following websites if IE Enhanced Security is enabled If IE Enhanced Security is enabled, then the following websites must be allowed on the server that is going to have the agent installed. Windows Server 2008 R2 ships with PowerShell v2.0, which is insufficient for the agent. Update PowerShell as explained below under Agent installation on Windows Server 2008 R2 Servers. 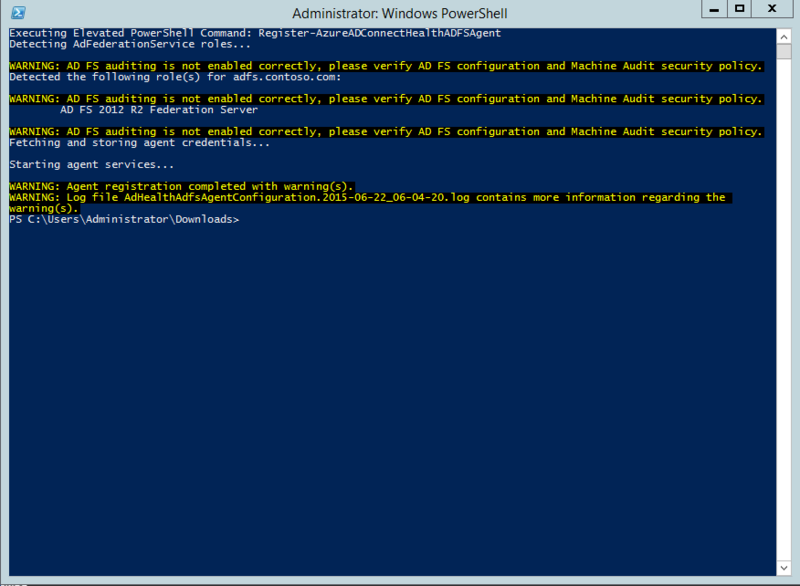 Windows Server 2012 ships with PowerShell v3.0, which is insufficient for the agent. Update the Windows Management Framework. Windows Server 2012 R2 and later ship with a sufficiently recent version of PowerShell. 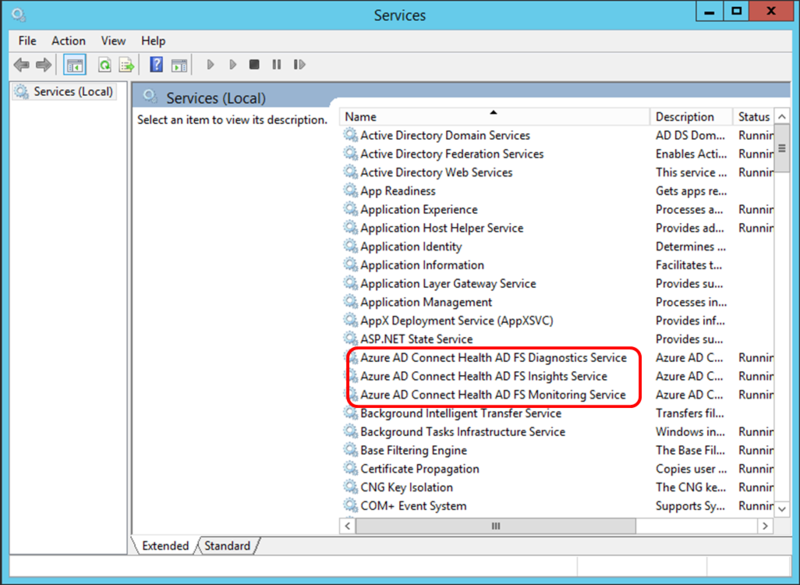 Disable FIPS FIPS is not supported by Azure AD Connect Health agents. https://www.office.com *this endpoint is only used for discovery purposes during registration. https://www.office.de *this endpoint is only used for discovery purposes during registration. Make sure that you satisfy the requirements for Azure AD Connect Health. 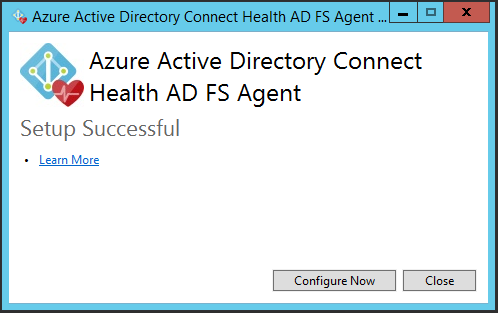 Download Azure AD Connect Health Agent for AD FS. Download and install the latest version of Azure AD Connect. The Health Agent for sync will be installed as part of the Azure AD Connect installation (version 1.0.9125.0 or higher). 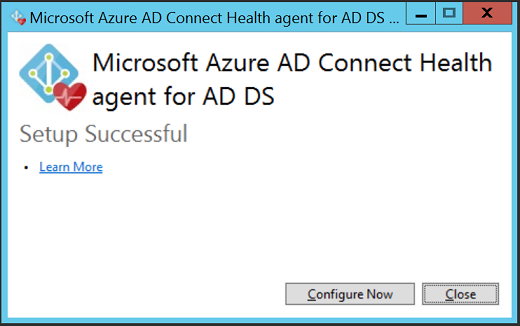 Download Azure AD Connect Health Agent for AD DS. AD FS server should be different from your Sync server. Do not install AD FS agent to your Sync server. Before installation, make sure your AD FS server host name is unique and not present in the AD FS service. To start the agent installation, double-click the .exe file that you downloaded. On the first screen, click Install. Once the installation is finished, click Configure Now. This launches a PowerShell window to initiate the agent registration process. 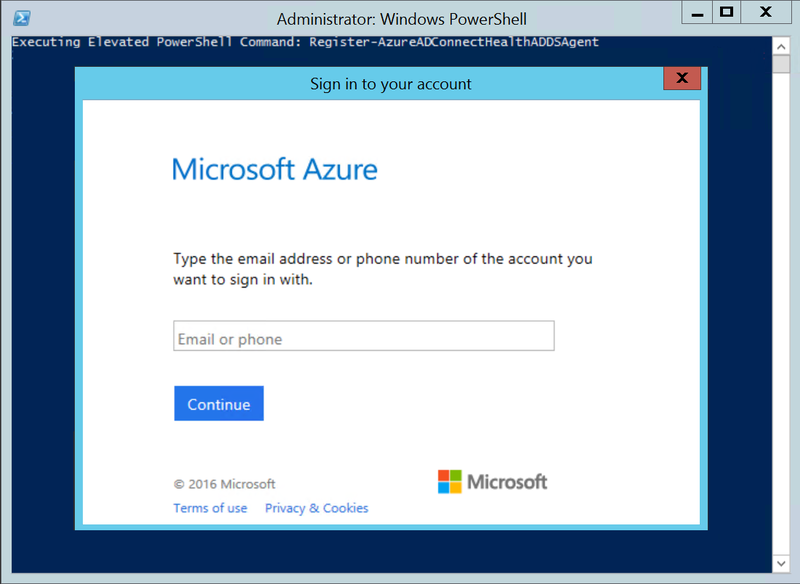 When prompted, sign in with an Azure AD account that has access to perform agent registration. By default the Global Admin account has access. After signing in, PowerShell will continue. Once it completes, you can close PowerShell and the configuration is complete. At this point, the agent services should be started automatically allowing the agent upload the required data to the cloud service in a secure manner. If you have not met all the pre-requisites outlined in the previous sections, warnings appear in the PowerShell window. Be sure to complete the requirements before installing the agent. The following screenshot is an example of these errors. To verify the agent has been installed, look for the following services on the server. If you completed the configuration, they should already be running. Otherwise, they are stopped until the configuration is complete. Ensure that the server is running at Service Pack 1 or higher. Install Microsoft .NET Framework 4.5 using the following link to download the offline installer. Install the Windows Management Framework 4.0. For more information on installing Windows PowerShell 4.0 on Windows Server 2008 R2, see the wiki article here. This section only applies to AD FS servers. You do not have to follow these steps on the Web Application Proxy Servers. In order for the Usage Analytics feature to gather and analyze data, the Azure AD Connect Health agent needs the information in the AD FS Audit Logs. These logs are not enabled by default. Use the following procedures to enable AD FS auditing and to locate the AD FS audit logs, on your AD FS servers. Navigate to the Security Settings\Local Policies\User Rights Assignment folder, and then double-click Generate security audits. Open the AD FS Management snap-in. To open the AD FS Management snap-in, click Start, point to Programs, point to Administrative Tools, and then click AD FS 2.0 Management. Open Local Security Policy by opening Server Manager on the Start screen, or Server Manager in the taskbar on the desktop, then click Tools/Local Security Policy. On the Local Security Setting tab, verify that the AD FS service account is listed. If it is not present, click Add User or Group and add it to the list, and then click OK.
Open the AD FS Management snap-in (in Server Manager, click Tools, and then select AD FS Management). Select the Success audits and Failure audits check boxes and then click OK.
On the Local Security Setting tab, verify that the AD FS service account is listed. If it is not present, click Add User or Group and add the AD FS service account to the list, and then click OK. Select the Success audits and Failure audits check boxes and then click OK. This should be enabled by default. Open a PowerShell window and run the following command: Set-AdfsProperties -AuditLevel Verbose. Go to Windows Logs and select Security. On the right, click Filter Current Logs. 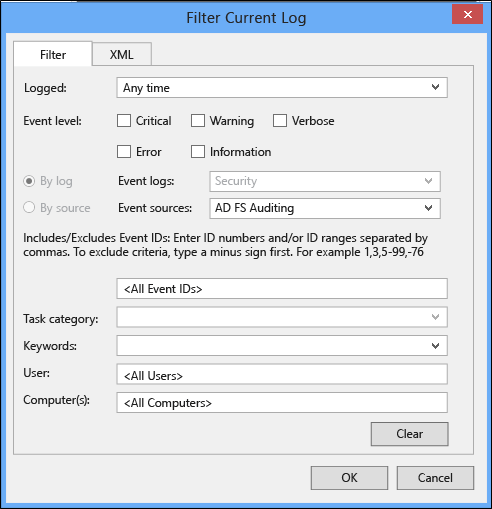 Under Event Source, select AD FS Auditing. And quick FAQ note for Audit logs. The Azure AD Connect Health agent for sync is installed automatically in the latest build of Azure AD Connect. To use Azure AD Connect for sync, you need to download the latest version of Azure AD Connect and install it. You can download the latest version here. Remember that using Azure AD Connect Health requires Azure AD Premium. If you do not have Azure AD Premium, you are unable to complete the configuration in the Azure portal. For more information, see the requirements page. If the Azure AD Connect Health for Sync agent registration fails after successfully installing Azure AD Connect, you can use the following PowerShell command to manually register the agent. Using this PowerShell command is only required if the agent registration fails after installing Azure AD Connect. The following PowerShell command is required ONLY when the health agent registration fails even after a successful installation and configuration of Azure AD Connect. The Azure AD Connect Health services will start after the agent has been successfully registered. AttributeFiltering: $true (default) - if Azure AD Connect is not syncing the default attribute set and has been customized to use a filtered attribute set. $false otherwise. StagingMode: $false (default) - if the Azure AD Connect server is NOT in staging mode, $true if the server is configured to be in staging mode. When prompted for authentication you should use the same global admin account (such as admin@domain.onmicrosoft.com) that was used for configuring Azure AD Connect. To start the agent installation, double-click the .exe file that you downloaded. On the first screen, click Install. 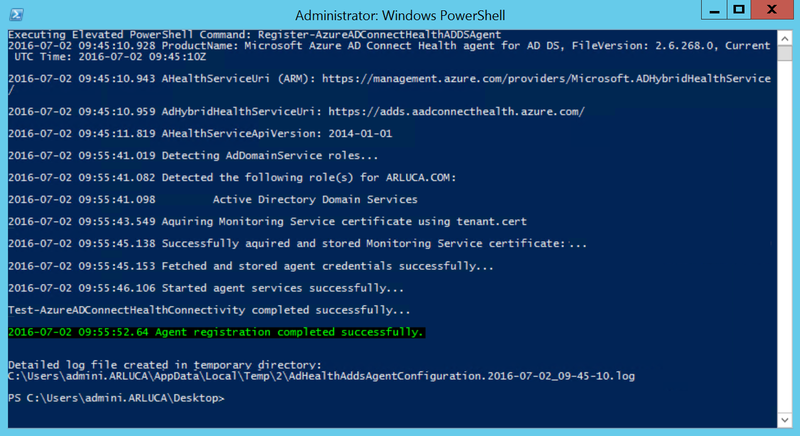 A command prompt is launched, followed by some PowerShell that executes Register-AzureADConnectHealthADDSAgent. When prompted to sign in to Azure, go ahead and sign in. At this point, the services should be started automatically allowing the agent to monitor and gather data. If you have not met all the pre-requisites outlined in the previous sections, warnings appear in the PowerShell window. Be sure to complete the requirements before installing the agent. The following screenshot is an example of these errors. To verify the agent has been installed, look for the following services on the domain controller. If you completed the configuration, these services should already be running. Otherwise, they are stopped until the configuration is complete. Create a user account in Azure AD with a password. 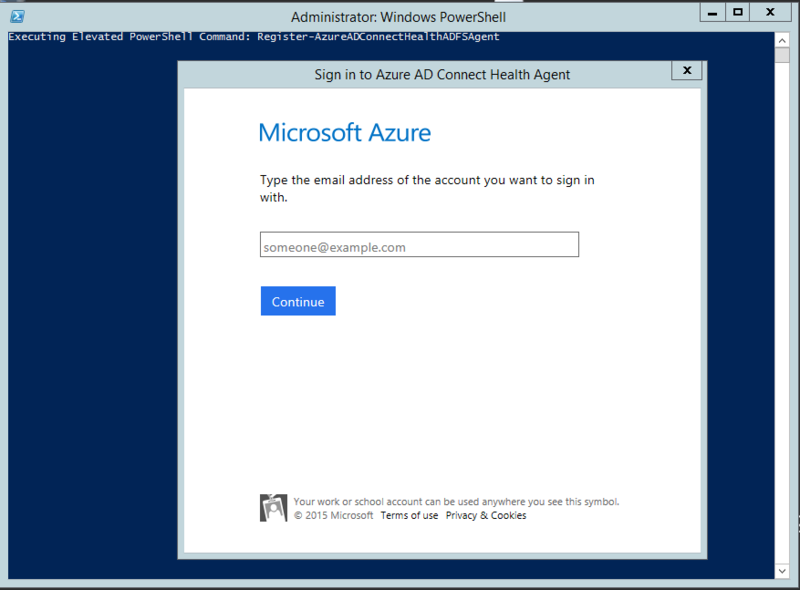 Assign the Owner role for this local AAD account in Azure AD Connect Health via the portal. Follow the steps here. Assign the role to all service instances. Download the .exe MSI file in local domain controller for installation. Run the following script to registration. Replace the parameters with the new user account created and its password. Rotate the password for the local account. These commands accept "Credential" as a parameter to complete the registration in a non-interactive manner or on a Server-Core machine. The Credential can be captured in a PowerShell variable that is passed as a parameter. You can provide any Azure AD Identity that has access to register the agents and does NOT have MFA enabled. By default Global Admins have access to perform agent registration. You can also allow other less privileged identities to perform this step. Read more about Role Based Access Control. You can configure Azure AD Connect Health Agents to work with an HTTP Proxy. Using “Netsh WinHttp set ProxyServerAddress” is not supported as the agent uses System.Net to make web requests instead of Microsoft Windows HTTP Services. The configured Http Proxy address is used to pass-through encrypted Https messages. Authenticated proxies (using HTTPBasic) are not supported. You have the following options to configure Azure AD Connect Health Agent to use an HTTP Proxy. "port" can be omitted. If omitted then 443 is chosen as default port. 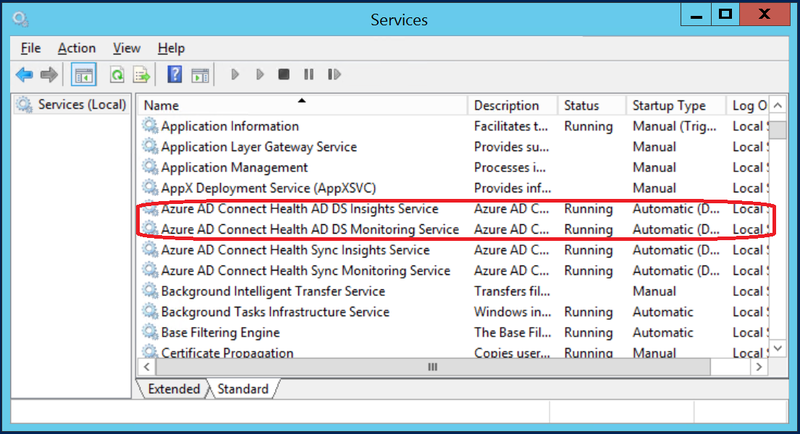 It is possible that issues may arise that cause the Azure AD Connect Health agent to lose connectivity with the Azure AD Connect Health service. These include network issues, permission issues, or various other reasons. To use the connectivity tool, you must first complete the agent registration. If you are not able to complete the agent registration, make sure that you have met all the requirements for Azure AD Connect Health. This connectivity test is performed by default during agent registration.